NEW YORK—Quickly running into his bedroom and slamming the door behind him after hearing public criticism of the statements he made regarding the family of a fallen Muslim-American U.S. Army captain, Republican presidential nominee Donald Trump reportedly threw himself on his bed Tuesday and asked himself “Why can I never seem to say the right thing?” while weeping into his pillow. 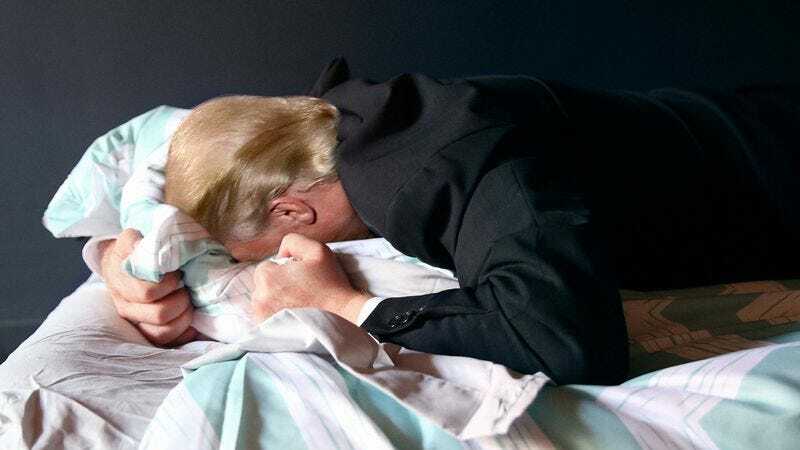 “Every time I open my mouth, the words come out all wrong,” Trump reportedly said in between long, heaving sobs, his voice muffled by the pillow as he occasionally pounded a balled-up fist into the mattress. “I try so hard, but I just can’t talk right, and everyone gets so mad at me. I just wish I could talk nicely like everyone else.” At press time, an exhausted Trump had reportedly cried himself into a perfectly sound sleep.